Artist Dave McGary poses with Kahnawake residents, including the Sweet Grass singers, who attended the Oct. 27 ceremony to unveil The Emergence of the Chief. 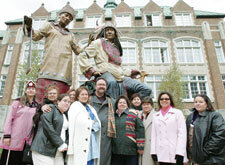 The 16 foot high statue acknowledges the Loyola Campus’s origins as Kanienkehaka (Mohawk) territory. The Loyola campus has been an English-language Jesuit college, a French family farm and, before that, Kanienkehaka (Mohawk) territory. This multi-layered history set the tone for the unveiling of The Emergence of the Chief, a 16-foot-high, 6,000-pound bronze sculpture on Oct. 27. A gift from the CALP Foundation and the Power Corporation, it is in the quadrangle behind the Administration Building, facing west toward the Richard J. Renaud Science Complex, with its back to the Central Building. Renaud, a member of the Board of Governors, was the driving force behind the project. He gave a moving speech at the ceremony. The two figures of the statue portray the Kanienkehaka matrilineal tradition. The chief is being instructed in his responsibilities by the clan mother. In his speech, President Claude Lajeunesse remarked that 80 per cent of the 140 First Nations students currently registered at Concordia are women. One of them, Sheila Whitebean, spoke at the ceremony. The event began with a blessing by Elder Kanasohon Deer. The Arizona-based artist, Dave McGary, spoke about his work. He cast the sculpture with the help of Concordia Fine Arts students. McGary also created a series of busts, maquettes and masterworks of the piece to sell in galleries across North America at prices between $3,500 and $21,500. Over the next two years, six per cent of these proceeds will be donated to a scholarship program for Kanienkehaka students at Concordia. After several speeches outdoors in uncharacteristically cold temperatures, over 200 invited guests moved into the Renaud Science Complex lobby for a meal of First Nations foods. The meal, featuring corn soup, bannock and braised buffalo and beef, was prepared by Java U, based on First Peoples recipes. “They surpassed the bar I set for them,” said Sharon Fraenkel, director of events for the Office of Advancement and Alumni Relations. Fraenkel himself deserves kudos for orchestrating the event only two weeks into his appointment at Concordia. “This was the first event of a brand new department.” Fraenkel’s office is responsible for 114 alumni-related and fundraising events between June 1, 2005, and May 31, 2006.